All summer long I grow zucchini in my garden. This year I grew 7 zucchini plants and enjoyed harvesting it nearly every week! 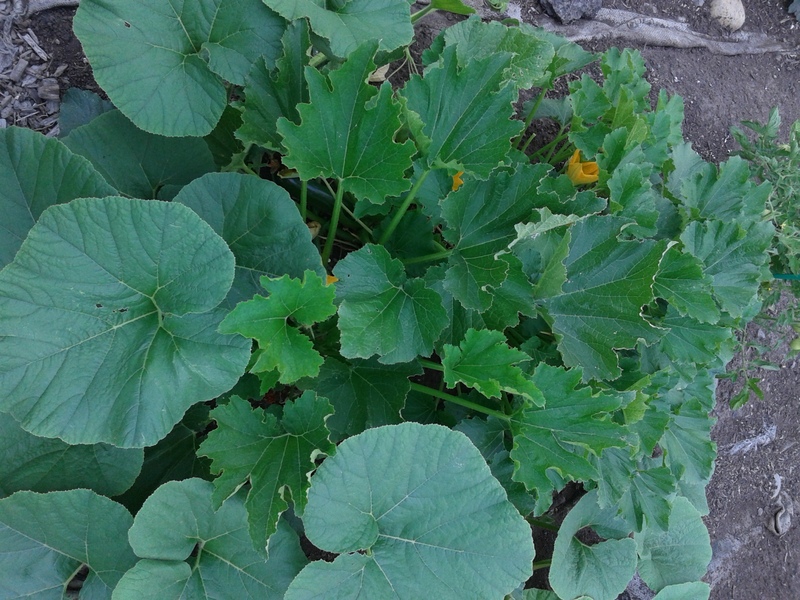 My black beauty zucchini plant mingling with my pumpkin plant. Zucchini is one of my favorite foods, high in folate, vitamin A, vitamin B-6, B-1, B-2, vitamin C and potassium. I have a challenging time eating enough foods with B vitamins, as many foods high in vitamin B are also high in nickel, such as soy, shellfish, leafy greens and oats. *The recipe calls for 1 teaspoon of baking powder, which does contain nickel. Whereas, baking soda doesn’t contain nickel. Since the recipe asks for such a small quantity of baking powder, I usually add it. However, you may substitute either a mixture of ¼ teaspoon baking soda with ½ teaspoon cream of tartar OR lemon juice or ½ teaspoon lemon juice, for the 1 teaspoon of baking soda. It’s essential you prep your shredded zucchini before you combine the dry ingredients with the wet ingredients. 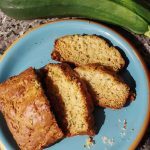 I have adapted this recipe from the Joy of Cooking Cookbook – “Sweet Zucchini Bread” on page 628. I am in the process of upgrading my bread pans from non-stick stainless steel pans (which include nickel) to nickel free bread pans. I cannot decide between the silicon bread pans or the Lodge cast iron bread pan. I’ve also love to use Pyrex glass dishes to cook this recipe. First grate 2 cups of zucchini so it’s prepared and set aside. 2 cups of grated zucchini is usually the equivalent of 2-3 small zucchinis or 1-2 large zucchinis. Be sure to squeeze the excess moisture out of the zucchini. I squeeze the moisture out, when I measure out 1 cup and press my fingers down on the zucchini over the sink. Initially, I mixed the wet and dry ingredients prior to grating my zucchini and the bread didn’t set as too much moisture had gotten into the recipe. To prevent this from happening, just grate the zucchini first before mixing all the ingredients together! If you have a nickel free bread pan you like or use, I’d love to hear about it, by leaving a comment below. If you try the recipe, please rate it below! 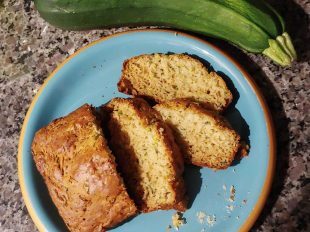 Nothing says the end of summer like homemade low nickel sweet zucchini bread! This bread recipe will literally melt in your mouth. Grate 2 cups of zucchini so it’s prepared and set aside. Mix the dry ingredients in a large bowl and in a separate smaller bowl, mix the wet ingredients, excluding the zucchini. Pour your wet ingredients in with your dry ingredients. Once everything is combined, add the 2 cups of grated zucchini and mix all the ingredients together. Once everything is combined, I spray two bread pans with olive oil and sprinkle it with flour on all sides. 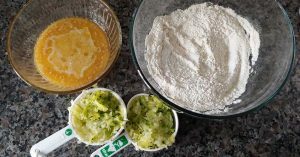 Pour the mixture into either one bread pan for a large loaf of zucchini bread, or two bread pans for two medium sized loaves. Bake the bread for 45-50 minutes. It should pass the toothpick test, where when you place a toothpick into the bread it should come out clean. Lastly let your zucchini bread cool for 5-10 minutes and enjoy! If you make two loaves of zucchini bread and freeze it, don't use aluminum foil. Instead, I'd suggest using a freezer Tupperware container or freezer specific Ziploc bag. I am excited to try this recipe! I have been looking for a tasty and tried/true recipe for sandwich bread and a crusty bread (to go with soups). Have you found some recipes for those kinds of breads? I hope you enjoy this recipe! I haven’t found a recipe for sandwich bread or crusty bread. If I find one, I’ll let you know! Prior to my allergy diagnosis in 2009, I thought about getting a bread machine. However, I think they’ll all be made with stainless steel. What bread pan did you end up deciding to buy? I was thinking of maybe lining my bread pans with wax or parchment paper until I purchase new ones. Have you tried that by chance? I’m hoping it’ll at least help my cooking absorb less nickel until I purchase better cookware. Thanks for your comment. I still use the same stainless steel bread pans. 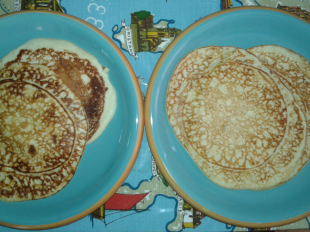 However I’ve become better at using parchment paper to line the pans. 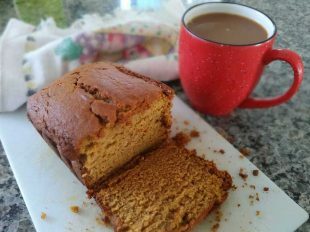 Check out my pumpkin bread recipe post to see what I mean. I also use long glass pyrex dishes I bough in a pyrex set. I can’t wait to try the recipe. Will do olive cause can’t tolerate corn which I know you can. Or cinnamon. Have you tried juicing? Cucumbers did not work for me but am now trying zucchini. Thanks for your comment. 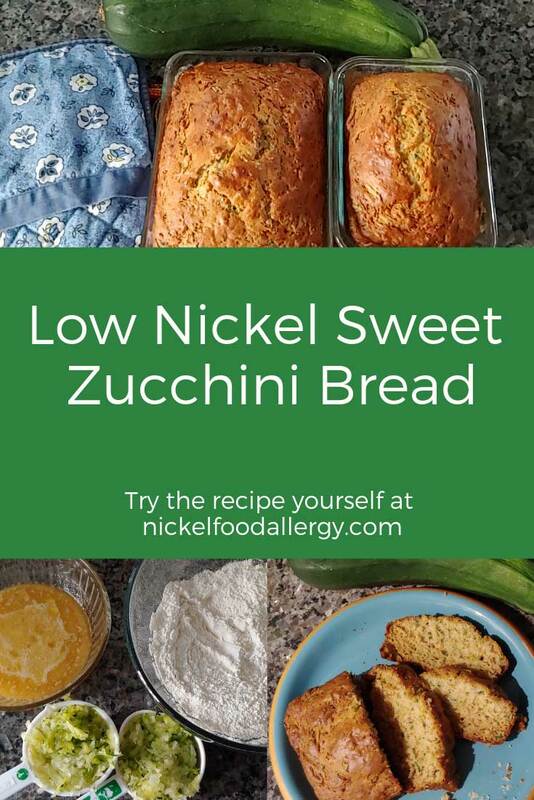 I love to use olive oil and you’ll have to tell me how the Sweet Nickel Free Zucchini Bread works out when you try it! I have juiced, but don’t currently as it tends to spike my blood sugar. It makes me so happy you and your family enjoyed my low nickel zucchini recipe. Thank you so much for rating it!